The organizers: Exhibition Company "Mir-Expo", Union of Composites Manufacturers. The 9th edition of COMPOSITE-EXPO exhibition organized by the Exhibition Company "Mir-Expo" jointly with the Union of Composites Manufacturers was held on February 17 - 19, 2016 at IEC Crocus Expo. Despites the current economic situation and currency exchange rate fluctuations, the Russian market for composite materials and equipment is actively developing and extending. At the moment there is a task in front of the domestic manufacturers to improve their competitive position for potential import substitution. The high currency exchange rate only induces the companies to achieve this goal: there is an active search for new alternative materials, new niches and development of new materials. COMPOSITE-EXPO is a leading international specialized event in composite industry in Russia, where full range of manufactures of raw materials, equipment and finished products of composites is widely introduced. In 2016 the display area increased by more than 5% and the exhibition attracted by 7% more visitors in comparison with the last year edition: about 9000 specialists. 123 exhibitors from 19 countries (Austria, Belgium, Belarus Republic, Czech Republic, France, Finland, Germany, Italy, Japan, Lithuania, Luxemburg, Macedonia, Netherlands, the People’s Republic of China, Poland, Russia, Spain, Sweden and United Kingdom) took part in the show. Among the permanent exhibitors of the show there were the following companies: Institute of New Carbon Materials (INUMiT), Carbon Studio (Composites Solutions LLC), Akzo Nobel N.V., Airbus Group, Airtech Europe Sarl, Bang & Bonsomer, Jushi Group, Mikrosam AD, Larchfield Ltd, BauTex, Melytec LLC, P-D Tatneft-Alabuga Fiberglass LLC, Evonik Industries AG, Elektroizolit JSC, Dugalak LLC, OCV Steklovolokno JSC, Union of Composites Manufacturers, INTREY Polymer Systems LLC, Fives Group, STEVIK SAS, Tatneft-Presscompozit, Lavesan Srl, SvetlogorskKhimvolokno, SKM Polymer LLC, GRM Systems Ltd, Kroenert GmbH & Co KG, Toray International Europe GmbH, BMP Technology, Lavesan Srl, Shandong Fiberglass Group Corp. and others. The following companies exhibited at the event for the first time: Neva Technology LLC, Smolensk Composites Cluster, Hoffmann Professional Instruments LLC, Central Research Institute for Special Machinery (Federal Research and Production Center), Attika, Breton, Volgogradpromproekt LLC, Gambit JSC, Sealing Materials Plant, Coatema Coating Machinery GmbH, Interdeck, Krylov State Research Centre, Kurganhimmash and others. Smolensk composite cluster - is a new Federal scientific, educational and industrial center for products made from composite materials, with a core company which is one of the leading factories in Russia manufacturing large-sized products from composite materials - JSC "Avangard", located in Safonovo. Smolensk composite cluster brings together industrial enterprises, scientific and educational institutions, government agencies, engineering and service companies cooperating in the field of research, design and manufacturing products from composite materials. Cluster products: industrial smoke stacks, chemical resistant containers, modular construction, radiotransparent covers, different types of glasses, elements for small aircrafts, biogas units. The ALABUGA-FIBRE facility was established by Holding Company Composite (HCC) by the order of the State Atomic Corporation Rosatom. The company presented various types of carbon fiber at the exhibition. Currently the types of carbon fiber are available for sampling and sale. Carbon Fiber can be used for various composite applications (e.g. aviation, civil engineering, automotive, marine) to achieve excellent performance. Airtech Europe Sarl – one of the world leading manufacturers and suppliers of vacuum bagging and composite tooling materials serving the composite, bonding and tooling industry – presented an embossed film which can be used without breather fabrics, reducing cycle times. Breton multipurpose machining centres are specially conceived for high speed, top performance and unbeatable versatility. In the production line there are machines designed for composite material machining. These machines are used at the leading aerospace industry enterprises in Russia and worldwide. A real innovation is represented by the patented solution to perform controlled drilling of countersinking. This system is able to reduce dramatically the cycle times, increase the accuracy. Interdeck LLC presented at the show a revolutionary new product from Safas Corp. (USA) – a sprayable composite engineered stone for composite manufacturer. On February 17, 2016 the 9th Practical-Research Conference "Current State and Prospects of Development of Production and Use of Composite Materials in Russia", organized by the Union of Composites Manufacturers and the Exhibition Company "Mir-Expo" took place within the business program of Composite-Expo at the Conference-hall 2, Hall 1, Pavilion 1. The Conference attracted over 500 specialists. Such considerable number was achieved not alone by the web-broadcasting of the event (as reference - about 250 visitors in the hall and 350 ones - on-line) but by the hard-driving program as well. During the conference the matters regarding composite materials manufacturing and use, main problems of the Russian composite market development and the ways of their possible solving were discussed. The specialists of many Russian and foreign companies took part at the conference, among them: Bauman Moscow State Technical University, AeroKompozit JSC, Blue Cube Russia (Olin Russia), OSV Steklovolokno JSC, Evonik Chimia LLC, Bee Pirton SP LLC, All-Russian Scientific Research Institute of Aviation Materials ("VIAM" FSUE), Central Research Institute for Special Machinery, JSC (TSNIISM JSC), The Institute of Solid State Physics (ISSP), The National University of Science and Technology (MISiS), Holding Company COMPOSITE, BYK - Chemie GmbH, REAM-RTI LLC, INJINITY LLC, RUSCOMPOZIT Group of Companies and EPITAL JSC. On February 18, 2016 the Informational seminar"The North Rhine-Westphalia (NRW): nanotechnologies and composites - chances for Russian companies and universities" organized by the Economic Development Agency of the German State of North Rhine-Westphalia (NRW), Moscow, Russia took part within the business program of the Composite-Expo at the Conference-hall 3, Hall 2, Pavilion 1. The possibilities of cooperation between Russian and German companies and Universities in the field of new materials (composites) and nanotechnologies in different fields of their application were discussed at the Seminar. The following companies presented their solutions at the Seminar: the representatives of Germen Embassy (Science Department, Department of Shience and Economics), German House of Science and Innovation in Moscow (DWIH), NRW.INVEST (D?sseldorf, Germany), Cluster of Nano-, Micro-, and new materials & Photonics of the German State of North Rhine-Westphalia, Institute of Textile Technics (Rheinisch-Westf?lische Technische Hochschule Aachen (RWTH), Institute for New Materials Testing (Technical University, Dortmund, Germany) and the High School of Hamm-Lippstadt (Hochschule Hamm-Lippstadt). On February 18, 2016 the presentations and seminars of the exhibitors took place within the exhibition business program at Conference-hall 2, Hall 1, Pavilion 1. They are as follows: BYK Additives & Instruments and BYK-Gardner GmbH (Seminar title: Additives for cold and hot curing on the basis of polyether, epoxy and polyurethane resins, polymer materials' appearance control, Additives for polymer flooring, Additives for pultrusion); Coatema Coating Machinery GmbH (Speech title: Industrial non vacuum coatings for thin and thick layers for production of prepregs); WACKER CHEMIE RUS LLC (Speech title: Adhesives and Sealants on the basis of hybrid materials) and Hoffmann Professional Instruments (Speech title: Modern instruments for mechanic treatment of composites). At the same time with Composite-Expo, the 7th International Specialized Exhibition POLYURETHANEX was held. It allowed a wide range of specialists to get acquainted with innovation technologies of manufacturing and samples of finished products of polyurethane materials for different branches of industry and attracted significant attention of specialists of the industry: manufacturers and consumers of adhesive and sealing materials. 59 exhibitors took part in the events from 15 countries (Austria, United Kingdom, Hungary, Germany, Italy, People's Republic of China, Lithuania, Netherlands, Belarus Republic, Republic of Korea, Latvia, Russia, Republic of Moldova, Poland & USA). In 2016, the Independent audit check of statistic figures was carried out for the third time for the Composite-Expo and Polyurethanex exhibitions. According to the experts' conclusion, at the space over 6000 sq. m. there were 182 exhibitors, including 109 national (domestic) companies and 73 foreign ones from 19 countries. Over 15400 people visited the shows, 93% of them were specialists from different fields of industry. This makes evident the growing demands of the Russian market to use modern innovation materials and technologies in different industries. "Neva Technology has exhibited at Composite-Expo Trade Show for the first time, but at once stirred a great interest among the specialists by presenting a broad range of solutions for composites manufacture. During all the 3 days of the show our stand was in a focus of the specialists’ attention of different companies anyway dealing with composites. More than 100 specialists visited our stand during the show. At present the experts of Neva Technology has been profound negotiating with majority of the representatives of the companies, helping them to find more accurate solutions for their tasks for every production having its own particular characteristics. The event is a truly leader in the composites field that bundles main companies, industries and experts. We wish you to gain steam and keep up the good work!". "Composite-Expo 2016 brought more visitors to out stand in comparison with the last year event. The quality of the visitors increased as well. Mainly we had meetings with representatives of active production companies in marine, mass transportation, aeronautics& airspace industries who were interested in raw materials for composites manufacture. We also had visitors who are only about to start a new composites manufacture. The Composite-Expo Trade Show is always a great ground for meeting your old clients and getting the new ones". "This year Interdeck Company has exhibited at the show for the first time. On behalf of our company I’d like to express gratitude to the organizers of the show for their expertise and business-friendly atmosphere. During the Composite-Expo we met the new would-be partners, shared the best practice with other exhibitors and learnt many new and useful things. We’d like to mention that visitors of the show were mainly professionals seeking new partners for mutually fruitful cooperation. This fact is very important for us. We’re planning to join the show next year. Many thanks to the organizers and other exhibitors of Composite-Expo 2016!". "Subsequent to the results of our communication with visitors I figured out that at this very event we had clients of a different quality. At the huge shows there is a great stream of people and it's hard to estimate the value of the client for the company. But here we met visitors of the definite subject, no stream, and you can devote more time to the communication with a client, take in the gist of the tasks rather than just take contact details with phone-you-later response. At the huge events many clients can't reach your stand physically - either they're short of time or they are already intercepted by other exhibitors and besides there is not time for communication unless the client comes exactly to you. At the not-large-scale events the visitor has enough time to investigate all the exhibition area, to attend all the stands needed and to devote the time to an unhurried talk: when a visitor shares current issues of the manufacture with you and we together search for the areas of common interest". 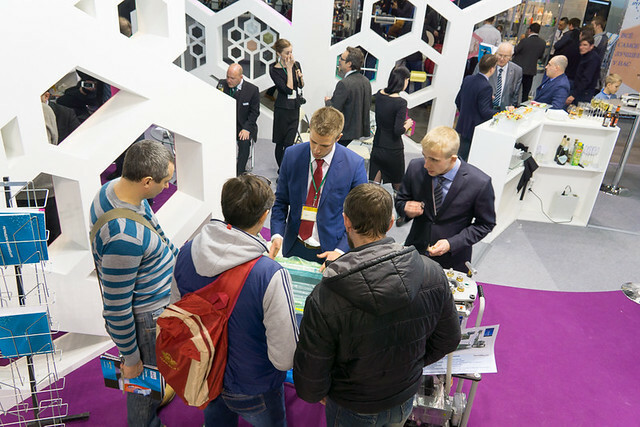 The next 10th edition of Composite-Expo will take place on February 28 - March 2, 2017 at Pavilion 1, Expocentre Fairgrounds, Moscow. Attention! You can find the video-interviews of the exhibitors of Composite-Expo 2016 in the Exhibitor List below. The exhibitors who has an interview are marked with . Or you can see all the interviews 2016 in the VideoGallery.